edulab is at your service since 2003. Its owner Thorsten Frank counts on his training-experience since 1998. Just get in touch and test edulab. ... for office-, dtp-, multimedia- and business-skills are edulab services helping you to optimize your knowledge and business every day. Adobe Flash or Dreamweaver training, Photoshop, Online-marketing-, Word- or Soft-Skill-workshop - only Trainer or All-in-one-service - edulab custumize its solutions and takes care about your needs! 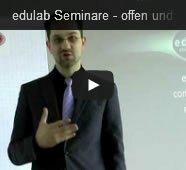 edulab helps you to build up or to improve your training-ressources in Central Europe (D-A-CH) in the fields of marketing and organisation. the best solutions for you.